Starting from Platis Gialos, we head off towards Paros Island, a place of considerable history and tradition. Paros Island figures among the best summer destinations in the Cycladic Islands and combines in a unique and enviable way modern infrastructure with traditional architecture and authentic spirit; is amongst the preferred holiday’s destination in Greece, attracting each year thousands of visitors and famous personalities. Naoussa: Naoussa has preserved the feeling of the pristine fishing village it truly is, beautifully mingling with the elegant atmosphere of the modern venue that it has become, with its tavernas and ouzeri. Kolimbithres: Kolimbithres is an exotic sandy beach with crystal waters and bizarre rocks creating small “swimming pools”. Located in Naoussa’s bay, Kolimbithres is definitely worth of visit. Paroikia: Paroikia, the capital of Paros, has maintained its picturesque style. Paroikia’s cute harbour, decorated with white houses, is typical of the Cycladic architecture. Our next destination is the island of Antiparos. 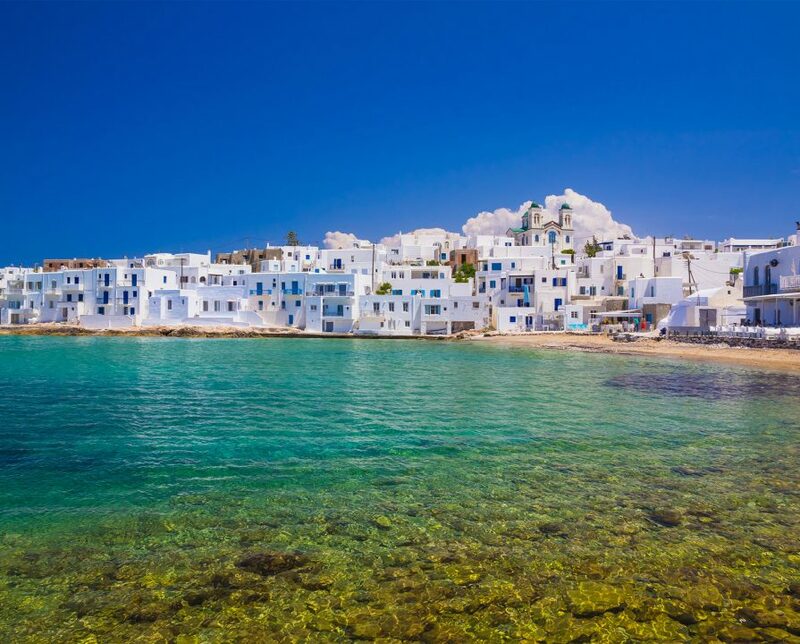 The charming little island of Antiparos in the insular complex of the Cyclades in Greece is endowed with splendid natural beauty, golden sandy beaches, many places of historical interest and sightseeing. Agios Georgios: Situated in the quaint village of Agios Georgios, this beautiful beach is nuzzled in a picturesque sheltered bay offering an exceptional view to the islet of Despotiko. Pateronisia: We will leave the secret unrevealed for you to explore! And when the sun is about to dive in the horizon, we will settle at Antiparos island. The coming day we will start cruising towards Schoinousa Island, an island of 9.5 square kilometers area that it is recommended for a relaxing, laid-back holiday. The serenity, the vast blue expanse of sea surrounding and the locals’ warm hospitality soothe body and soul so visitors can enjoy the land and its people. Next to see will be Koufonissia islands. Koufonissia attractions include their stunning natural scenery, mostly arid but astonishing, along with sightseeing sites like places of archaeological importance and, of course, marvelous exotic beaches. Kato Koufonissi: Kato Koufonissi is uninhabited, as far as a permanent population is concerned. Visit the island so as to experience its beautiful vibrant beaches. Lie on the soft sand, swim in the turquoise water, forget your obligations and forget the artificial simulation of life in the cities, surrender to the embrace of the sun. Pano Koufonissi: There is a population of 440 permanent inhabitants, mainly engaged in fishing and tourist activities, while farming and animal breeding serve mainly household needs. However, the island’s fishing fleet, considered in proportion to the size of its population, one of the largest in Greece and fresh fish and seafood delicacies are sure to tempt you. Pori beach: It is considered by many to be the most beautiful one on the island. Sandy, located at the lip of a large cove, which ensures calm water most of the time. It is sheltered from southerly and westerly winds. Keros Island: It is an important archaeological site. Excavations have brought to light finds of the Early Cycladic period 3200-2000 BC.A characteristic stone of the island is its white fine grain marble. Glaronissi Island: The island is named after the seagulls (glaros) which nest there in their hundreds. Surrounded by aquamarine waters, dotted with small beaches and sea caves, it is ideal for those who seek isolation, relaxation and reflexion. On our way back we will pass by the south coast of Naxos, taking the chance for a quick swimming. Our trip will end up when reaching back at the island of Mykonos and Platis Gialos Port.